Mouse anti Human hexokinase 1, clone 4D7 recognizes human hexokinase 1, a 102 kDa major allosteric enzyme of the glycolytic pathway, which catalyses the phosphorylation of glucose to form glucose-6-phosphate (Glc-6-P). 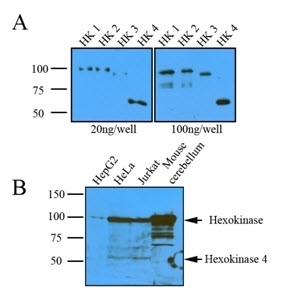 Hexokinase 1 is the first of four distinct mammalian hexokinase isozymes (hexokinase type 1 to 4), expressed in the outer membrane of mitochondria and is regulated (inhibited) by its product Glc-6-P. A deficiency in hexokinase 1 is implicated in the rare hereditary autosomal recessive disease known as nonspherocytic haemolytic anaemia (Newman et al. 1980). 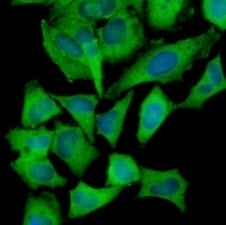 Mouse anti hexokinase 1, clone 4D7 recognizes an epitope common to all isoforms of human hexokinase. Recombinant human hexokinase 1 (amino acids 1-917) purified from Escherichia coli. MCA2698 detects a band of approximately 102kDa in HepG2 cell lysates. Wilson, J.E. (2003) Isozymes of mammalian hexokinase: structure, subcellular localization and metabolic function. J Exp Biol. 206 (Pt 12): 2049-57.